We were told to expect the 2016 Cadillac CT6 plug-in variant in Shanghai, and it seems Mark Reuss is a man of his word. 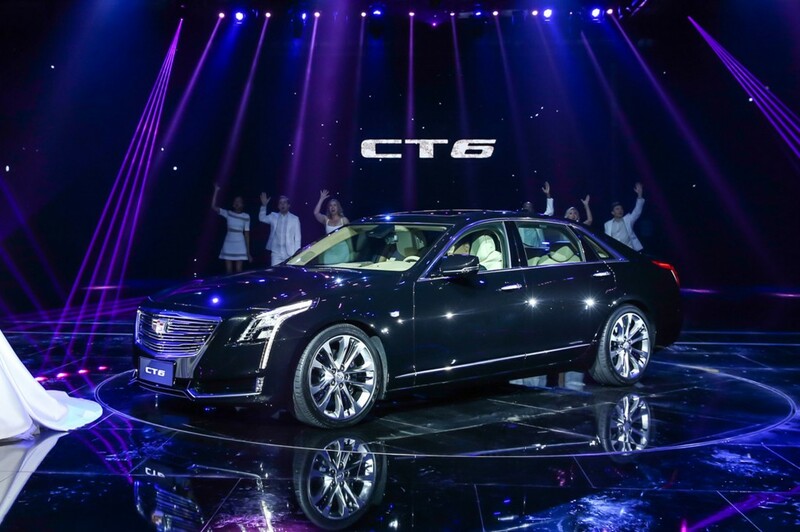 The 2016 Cadillac CT6 PHEV debuted today at Auto Shanghai 2015 and introduced a slew of new plug-in technologies, including a slick electric variable transmission. Cadillac is quick to point out the 2016 CT6 PHEV will offer double the fuel economy of the car’s conventional powertrains. The PHEV takes advantage of the already versatile Omega platform, and gears it to go green. Cadillac expects the all-electric range to be suitable for most daily commutes, but a blend of engine and battery power will maximize fuel efficiency at higher speeds, and larger loads. Providing the shock therapy to the 2016 CT6 PHEV’s fuel efficiency is a 18.4 kWh lithium-ion battery pack, located between the rear seats and the trunk. The battery uses the latest in cell chemistry, and is found on other new PHEV products from General Motors. Charging can be completed through either a 120V or 240V charger. The biggest news complimenting the lithium-ion battery is the addition of a Cadillac-developed electric variable transmission, or EVT. The EVT is a two-motor rear-wheel system working in harmony with the 2016 CT6 PHEV’s 2.0-liter turbo four-cylinder and the battery. Cadillac says the entire system is capable of producing 335 hp and 432 lb-ft of torque, while marrying smooth power delivery at all times. Cadillac didn’t stop there, though. The 2016 CT6 PHEV is also equipped with regenerative braking technology. iBooster and Electronic Stability Program have been tailor made for the CT6 to provide maximum energy recovery combined with reduced stopping distance and improved fuel economy over traditional regenerative braking systems. iBooster and ESP work as generators to slow the vehicle down alongside the traditional hydraulic brake system, capturing as much kinetic energy as possible along the way. This also allows the start/stop feature to engage more often, providing further fuel efficiency. As seen in the 2016 Cadillac ELR, the 2016 CT6 PHEV will include Regen On Demand. The technology slows the car upon entering a turn for better exit position, and is activated by the steering wheel mounted paddle shifters. Besides the sportier feel, it is able to convert current momentum into electricity to be stored for later use. We still have questions, though. Cadillac says it won’t be releasing pure-electric or combined fuel economy figures until we approach the car’s introduction in the U.S. and China. We can expect more PHEVs from Cadillac in the future, with the CT6 being the start. From what we can see on paper, though, the 2016 CT6 PHEV will be a luxurious, sporty, fuel efficient machine. Is there any exterior pictures? Does it look identical to the other models? Cadillac has provided the same photos from the 2015 New York Auto Show. When, and if, we receive new photos, we’ll be sure to update and add a gallery. I just saw a live picture from the actual unveiling, and the car looks exactly the same as the internal combustion CT6 models. This is by no means a bad thing though, as the CT6 looks great as it is, so why mess with a good thing? Werent they suppose to give out more info on the future V8 engine during Shanghai? There was a CT6 with a 4.0T badge on the back at the show. But I saw no details. BTW the PHEV sounds awesome! It’s not a 4.0t badge. Why does everyone keep saying that? It clearly says “400” on one side and “CT6” on the other side. The reason is has 3.0TT on the license plate is because that’s the motor that is in it. I think… I’m a little bit confused there because I thought it was going to be a 3.6TT but still. Just google “Shanghai-GM badge” and you should see 3 good pictures of the CT6 unveil. I am halfway through a 3-year lease on a Porsche Panamera e-hybrid plug in. Been waiting for Cadillac to announce this. Will be first in line to buy one if the specs hold up. That’s the one I was talking about. when they build a Buick verson…..maybe it would be called Buick Electra. Agree with a Buick version in time. Let the CT6 PHEV marinate as a Cadillac exclusive powertrain/chassis for couple of years first.